Gentle Readers, I usually take a one day blogging hiatus this time of year. Without particularly meaning to, I’ve taken longer this year. Don’t worry; it’s all for pleasant reasons. I’m about ready to begin again, but the week only has two blogging days left and it seems like a waste to get back going with the narrative for those and then stop for a weekend before restarting. Instead, let me share with you a letter that came to me courtesy of Louis Ruchames’ A John Brown Reader, which I did not have on hand when last I mentioned it. After being hard pressed to go with my family to Kansas as more likely to benefit the colored people on the whole than to return with them to North Elba; I have consented to ask for your advice & feeling in the matter; & also to ask you to learn from Mr. Epps & all the colored people (so far as you can) how they would wish, & advise me to act in the case, all things considered. As I volunteered in their service; (or the service of the colored people); they have a right to vote, as to the course I take. I have just written Gerrit Smith, Fredk Douglass, & Dr. McCune Smith, for their advice. We have a new daughter now Five days old. Mother & child are both doing well to appearance. Other friends well so far as I know. John & Wealthy are still with us. Will you write as soon as you can? Have not received your reply to my other questions. Few white men of his age would acknowledge a general debt to black Americans, let alone give them a say in such a momentous decisions as moving across the country. Brown asked the people he made the commitment to personally up in North Elba, and also Frederick Douglass and James McCune Smith, the latter the first black American to earn a medical degree. 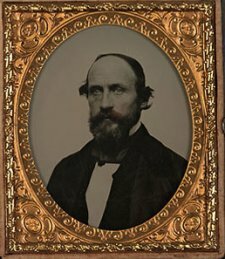 Squire Morse, an old Michigander with two kids, sold Frederick Brown some lead bars that he took over to the Grant house to make into bullets. Dutch Bill Sherman and his proslavery friends took note of that and told Morse that he needed to quit the area or he would leave it permanently at the end of a rope. He had until eleven that morning to get gone, at which point they returned and decided to upgrade his murder weapon to an axe. They also gave him until sundown, after his children cried and pleaded. Morse took his two boys and went to the Grant’s. He stayed with them for a while, but insisted on sleeping rough in the prairie rather than risk being caught in town at night. The stress of that and the threat to his life eventually ended it. The Grant family caught some of it too, with Dutch Henry Sherman calling to tell them of More’s expulsion and that many other antislavery families had to go too. William Sherman had taken a fancy to the daughter of one of his Free-State neighbors, and had been refused by her. The next time he met her he used the most vile and insulting language toward her, in the midst of which Frederick Brown appeared and was besought for protection, which was readily granted. Sherman then drew his knife, and, speaking to the young woman, said: ‘The day is soon coming when all the damned Abolitionists will be driven out or hanged; we are not going to make any half-way work about it; and as for you, Miss, you shall either marry me or I’ll drive this knife to the hilt until I find your life. Frederick supposedly told Sherman that if he tried it, “he would be taken care of.” Foster tells this all after the fact in a passage largely about defending the Browns for murdering Dutch Bill, so we have to read it with some skepticism. Furthermore, if the Browns or the other Pottawatomie Rifles thought that their families in the area stood at serious risk they most probably would have either stayed home or made arrangements for their safety. Sherman may have made the threat to the woman, and Brown answered it as reported, but their behavior suggests that they believed their hostile neighbors talked big and never delivered. Morse’s travail suggested that things had changed. The absence of the antislavery men and presence of Georgians who came those hundreds of miles to kill abolitionists bolstered their convictions. A rope, an axe, violent crying and violent illness. John Brown’s son Frederick went into Dutch’s Crossing to buy some lead bars. He aimed to use that lead for free state bullets and enlisted the Grant family to help make them. With Lawrence under threat again, they needed the ammunition. In many places, all that might go unmarked. Dutch’s Crossing presented several problems for that, all of which go back to the German-born “Dutch” Sherman brothers. Illegal squatters and likely petty criminals from way back, they went all-in for slavery and acted belligerently toward their antislavery neighbors. One of the Shermans and some of their proslavery friends saw Frederick Brown passing by with the lead and asked what he meant to do for it. Frederick told them. The proslavery men didn’t take it out on Frederick, a relatively young man carrying a bunch of useful bludgeons; a man could get bruised trying to bruise a guy like that. Instead they went to the older Michigander who ran a store nearby and sold the lead. Squire Morse, who had two small children, received a visit first thing in the morning as soon as the free state men moved out for Lawrence. Dutch Bill, the Doyles, and Allen Wilkinson (a bogus legislature member) showed him a noose and told him that they would hang him for selling the lead. But not just now. The proslavery men gave Morse until eleven to abandon his store and claim. They had only talked big before. Now they had a rope and gave a deadline. This fit the typical script for lynching a white man. The warning must have only felt sporting and refusing to abide by it would give them further aggravation. After making the threat, they departed to drink. About eleven o’clock a portion of them, half drunk, went back to Mr. Morse’s, and were going to kill him with an axe. His little boys -one was only nine years old- set up a violent crying, and begged for their father’s life. He left everything and came at once to our house. He was nearly frightened to death. He came to our house carrying a blanket and leading his little boy by the hand. When night came he was so afraid that he would not stay in the house, but went out of doors and slept on the prairie in the grass. All this for selling some lead, which Morse himself got from Dutch Henry originally. That Sherman brother got in on the action too, going over to the Grants to tell them that they had ordered Morse out “and a good many others of the Free-State families have to go.” George Grant doesn’t report it as a personal threat to them, but the Shermans knew that Brown took his lead to them to turn into bullets. With some Georgian proslavery militants nearby and the antislavery militia away, they had to feel intensely vulnerable. Affairs between the proslavery and antislavery white colonists in Kansas did not go smoothly in general. Nothing that had happened in the territory’s short, stormy history pointed toward happy coexistence. Osatwatomie fit perfectly with the rest of the territory, maybe more so courtesy of outspoken antislavery men like the Browns in close company with similarly outspoken proslavery men like the Doyles and Shermans. August Bondi found that out the hard way when, new to Kansas, he called on the former as a fellow German. On learning his antislavery politics, they told him that he’d best get lost or he might get lynched. There was a company of Georgia Border Ruffians encamped on the Marais des Cynges, about four miles away from us, who had been committing outrages upon the Free-State people; and these proslavery men were in constant communication with them. They had a courier who went backward and forward carrying messages. When news of the new threat against Lawrence came to the area, the free state men prepared to go to the town’s rescue. Frederick Brown visited a store run by a Michigander down at Dutch Henry’s Crossing, where the Shermans lived and operated their tavern. Frederick bought twenty or thirty pounds of lead, then took it over to Grant’s father’s house on a Sunday morning. Frederick and the Grant kids, including young George, spent the day making bullets from the lead. Heading from old Squire Morse’s store to the Grant home took Frederick past Dutch Henry’s house. There he found several proslavery men, including James Doyle and sons and Dutch William, Henry’s brother. Seeing a known free state man with a load of twenty or thirty pounds of lead got them wondering if he meant it for something. Frederick told them his business, which “much incensed” them. a number of these proslavery men-Wilkinson, Doyle, his two sons, William Sherman, known as ‘Dutch Bill’- took a rope and went to old Squire Morse’s house, and said they were going to hang him for selling lead to the Free-State men. John Brown, his son who was also a John Brown, and the Pottawatomie Rifles walked away from Dutch Henry’s tavern on April 21, 1856 with most of what they came for. They knew for a fact that Judge Sterling Cato, holding court there, would enforce the bogus legislature’s laws against being Kansas and antislavery…mostly. Cato secured no indictments against Kansans who declared against slavery, or even formed antislavery militia companies like Brown and his son. He did indict only free state Kansans, but only for regular offenses. The next day he closed up shop with those settled and moved a county over to indict another free state Kansan, this one for assault. The junior Brown made a big show of telling his band of armed men that they would meet immediately right where everyone in court could hear him, but all they did present Cato with a copy of the resolutions recently voted on to resist enforcement of the proslavery code by force if necessary. He left no record of Cato’s reaction. All of that didn’t amount to much, really. The free state men came out of it with the knowledge that the proslavery party would not stage an immediate crackdown, but the machinery of Kansas government had lurched further to life. What didn’t happen at one court session could happen at the next. For that matter, Missouri threatened to invade Kansas yet again. Across the territory’s political divide, the proslavery men around Osawatomie had parallel anxieties: among them lived a band of armed militants sworn to wage war against the forces of law and order. The implied threat to Cato’s court had to strike close to home for the Shermans (who hosted it), Allen Wilkinson (district attorney), Thomas McGinn (grand jury foreman), William Doyle (bailiff), James Harris and James Doyle (William’s father, both jurors). The Doyles also affiliated themselves with the Law and Order Party. Wilkinson served in the bogus legislature. “he had heard that Bondi and Benjamin [another German who had come with Bondi] were Freesoilers, and therefore would advise him to clear out, or they might meet the fate of Baker,” – a Vermont man whom the Border Ruffians had taken from his cabin on the Marais des Cynges, whipped, and hanged upon a tree, but had cut him down before death, and released him upon his promise to leave Kansas. Sandborn worshiped Brown and Bondi told him all this years later, probably while they clambered about Kansas trying to find where Bondi and Brown camped out in the spring and summer of 1856. He might have invented it as a handy way to tell how he came to meet the Brown family, though Frederick’s promise that if the Shermans caused trouble they could come to his rescue. But proslavery and antislavery Kansans often had poisonous relationships and the proslavery side in particular seems inclined to make violent threats, even if most of them didn’t go all the way to committing murder. Nothing that Bondi has Sherman threaten him with would depart from the norms established elsewhere. We left John Brown Junior departing Dutch Henry’s tavern, where Sterling Cato charged a grand jury. Junior, asking for his Pottawatomie Rifles and his unaffiliated father, wanted to know if Cato meant to enforce the laws of the bogus legislature. Those laws made expressing antislavery opinion in Kansas, something that probably every member of the company had done often and which Junior and his more famous father did to proslavery faces, illegal. Would Cato preside over their indictments, arrest, and trial? Not that Junior asked this in so many words, of course; one does not confess so openly to officers of the relevant court. He only wanted to know if Cato considered the legislature’s laws part of his court’s business or not. Those resolutions, recall, obliged the men who signed to them to resist the territorial government by force. Voting approval by taking up their guns made for good political theater and a decidedly literal expression of their position. Having turned the company into a mass meeting with extra firearms, they then went the next logical step and named a committee to deliver a copy of the resolutions to Cato. Junior doesn’t tell us anything about how Cato received that drama. Instead he passes on to what the court did the next day. Only indictments passed the grand jury, and them only against three people. One killed hogs belonging to someone else. Another sold alcohol to Native Americans. The third took a shot at a proslavery probate judge. All opposed slavery, but none faced charges for that specifically. No one in Kansas had much stomach for enforcing the extreme territorial code, but Cato’s jury did only direct its attention to antislavery men. Even leaving aside political violence and illegal voting, one wouldn’t expect ordinary crime to fall so exclusively on one side. At least some tried to jump claims -the Browns had a problem with one of those in January- or squatted illegally on Indian or government land and might have faced charges for that. All in all, the matter ended in anticlimax. Cato probably never intended to run an even-handed court, but he also didn’t go out hunting for the Browns and other antislavery men to prosecute to the fullest extent of the law. With no arrests, no daring rescue took place. Knowing that, we can dismiss this as so much incidental noise in the record. We should not. The Pottawatomie Rifles didn’t know that Cato would decline to enforce the law against them. Given the record of the proslavery party in Kansas, they had good reason to fear he might do so and acted accordingly. When they marched to the tavern, leaving their guns behind, they might well have walked straight into a jail or had to fight their way free. Keeping the guns so close testifies to the genuine fear that this might all end in a shoot out, or at least intimidation at gunpoint to keep the free state men at liberty.